This article uses 'example.com' as a general site folder. 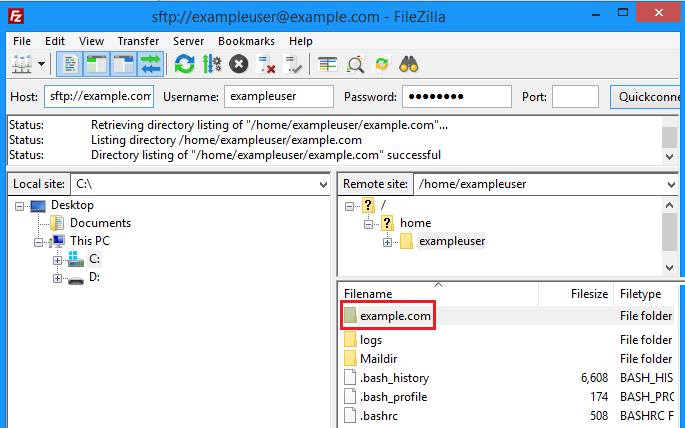 Make sure to look for your actual domain folder name when logging in. The left pane is your home computer. The right pane is your DreamHost server. Looking at the right side, you'll notice that you are not yet in your website's directory. This is because when you originally log in, you're in your USER's home directory. This is where all files under your webserver's username live. To work on your site, click into your website folder. You must navigate to the folder on your computer where your files are stored. From that directory, you can upload files to the server, or download from the server. On the right, you'll see your DreamHost web server. You should already have clicked into the directory name of your website. This example shows that the user is in their website directory. You can see this because the ‘Remote site’ is pointed to /home/exampleuser/example.com. Please note that different clients may not refer to this as Remote site. The important thing is that you're in your user's directory. If you look at the window below that, you’ll see the files and folders within that directory. This example shows several WordPress files. 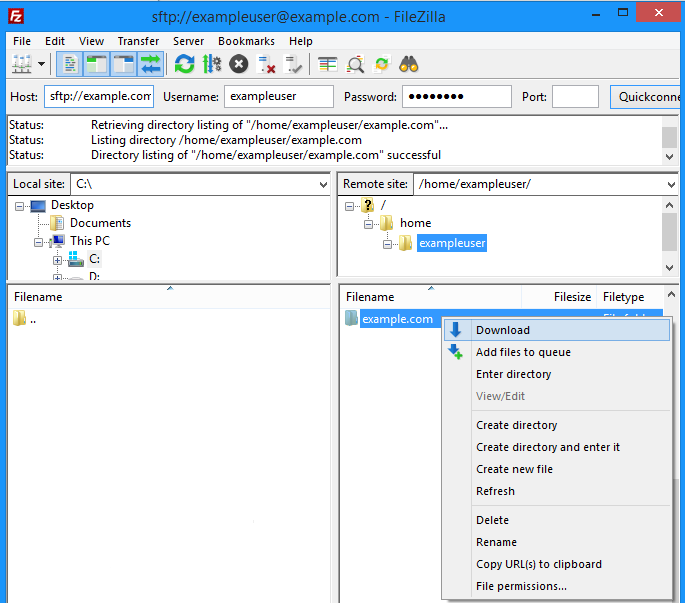 Once both panes are set to the correct directories, you can right click files or folders to upload or download. In the left window (your computer) locate the file or folder you'd like to upload. From the pop-up, choose 'Upload'. This uploads the file to the server. You can immediately see the file in the right pane. 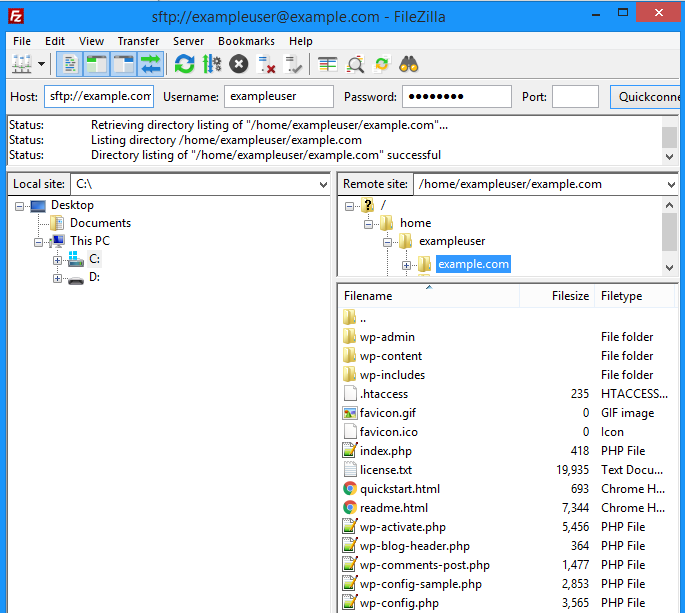 If the right pane is set to your website directory, the file is then live on your website. To download from the server, right click a file or folder and choose 'Download'. If you want to download your entire website, navigate back to the user directory. You can see this in the 'Remote site' field. Next, right click the website folder titled 'example.com'. From the pop, choose download. The full folder and all of its files are then downloaded to your computer. 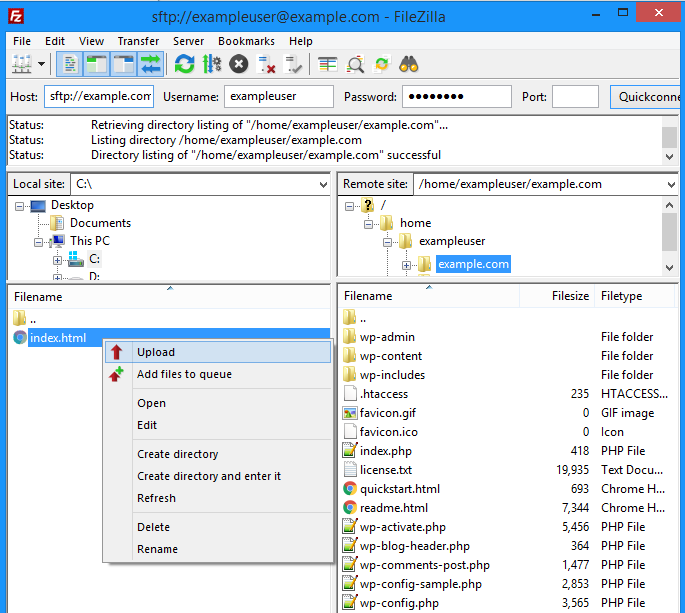 Your user's directory is where you'll see all of your user config files, Maildir, logs, and site folders. You will never upload your content to this directory.